Allen scoping out the river. 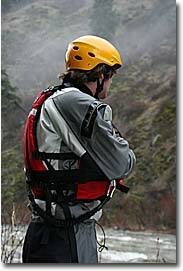 When you haven’t used your drytop, drypants or drysuit for awhile, it pays to check on their condition before using them again. The main thing to look at is the condition of the latex gaskets. Latex is a great material: it’s stretchy, supple and form fitting. But it’s also subject to deterioration and damage. If the gaskets are torn or cracked, they need to be replaced. Our Repair Department can do this for you. We can also do other minor dry wear repairs (call for more information), and can recommend sources for major repairs. You can also do it yourself. We have complete illustrated Gasket Repair Instructions on the website, along with links to the necessary replacement gaskets, adhesives and tools needed. On the same page are excellent tips on the proper care of your dry wear. Wash the garments in cold water after each use, air dry them, and avoid getting sunscreens on the gaskets. Store the garments in dry, temperature controlled areas away from light sources. The best thing you can do to prolong gasket life is to treat them with 303 Protectant after each use and every 4-6 weeks while the garments are being stored. 303 is an SPF 40 sunscreen and protects against naturally occurring ozone, which really eats up latex. Don’t wait to check out your dry wear. It’s frustrating to get invited on a trip and find out at the last minute that your gear isn’t up to the challenge.